US equities have seen some increasingly unstable and bearish price action ahead of the Dec'16th FOMC. More than anything, if the sp'500 can't break a new historic high (>2134) in the next multi-week up wave into January, it will bode for serious downside in 2016. 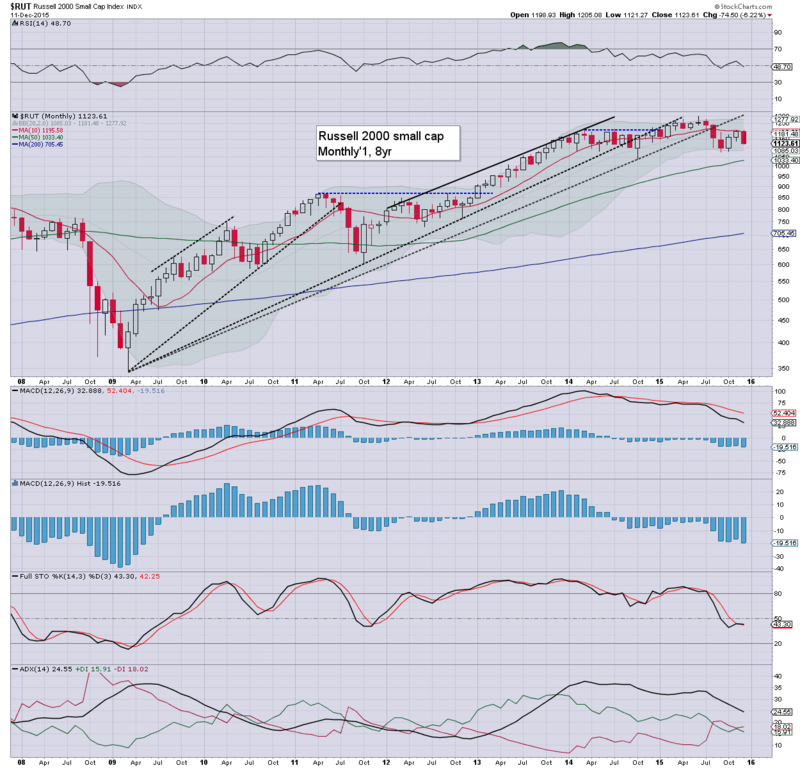 So far this month, the sp' is -3.3%, trading below the 10MA of 2049. It is indeed highly notable that the 10MA - having largely flat lined across 2015, is now vulnerable to spiralling lower. Underlying MACD (blue bar histogram) cycle is starting to tick lower again.. and this is a very subtle, but particularly bearish aspect. 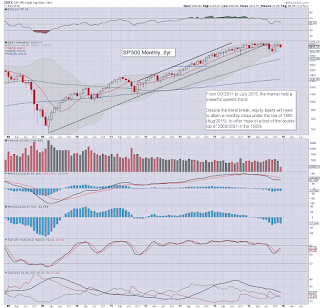 Price structure on the giant monthly chart is offering a giant bear flag, that stretches from the Aug' low of 1867. 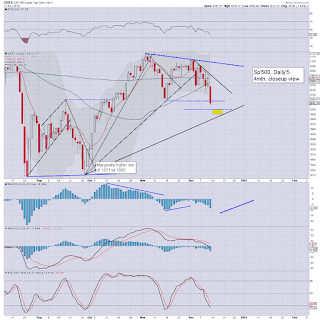 So long as the bears can hold the post FOMC rally under the May high of 2134.. the bear flag remains valid. A Dec' close under the 10MA would be very bearish, and open the door to the market challenging the Aug' lows in spring 2016. The tech' is currently -3.4% for the month, unable to hold the psy' level of 5K. If any post FOMC rally is not sustained above 5K, first downside target will be the 4300/200s. The mighty Dow is looking shaky.. currently net lower by -2.6% @ 17265. There is rather powerful resistance at the 18K threshold. 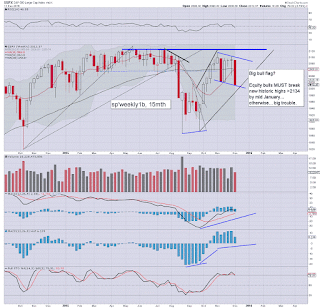 Indeed, on any post FOMC rally.. equity bulls MUST break and hold 18K in January. 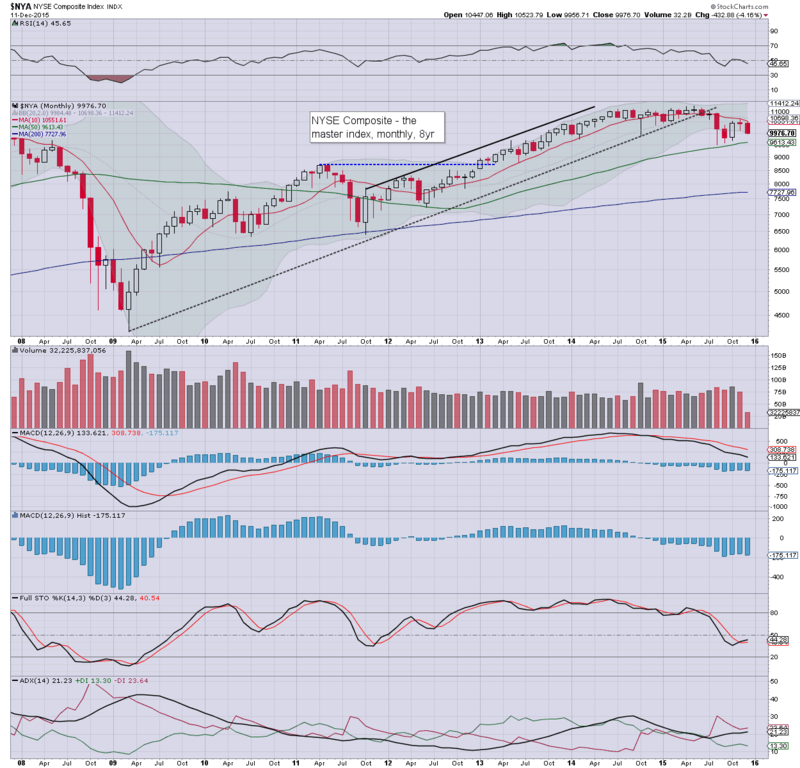 If the market unravels... first downside target will be the Aug' low of 15370, and then 15K. The master index is particularly struggling, net lower by -4.2%. It is highly notable that the 10MA is increasingly spiralling lower, and the NYSE comp' can't yet manage to trade above it. 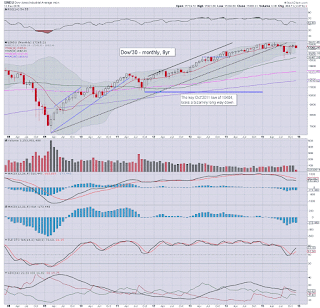 Equity bulls need to see the 11000s in the next multi-week wave higher.. but that is a clear 10% higher.. and looks really difficult. 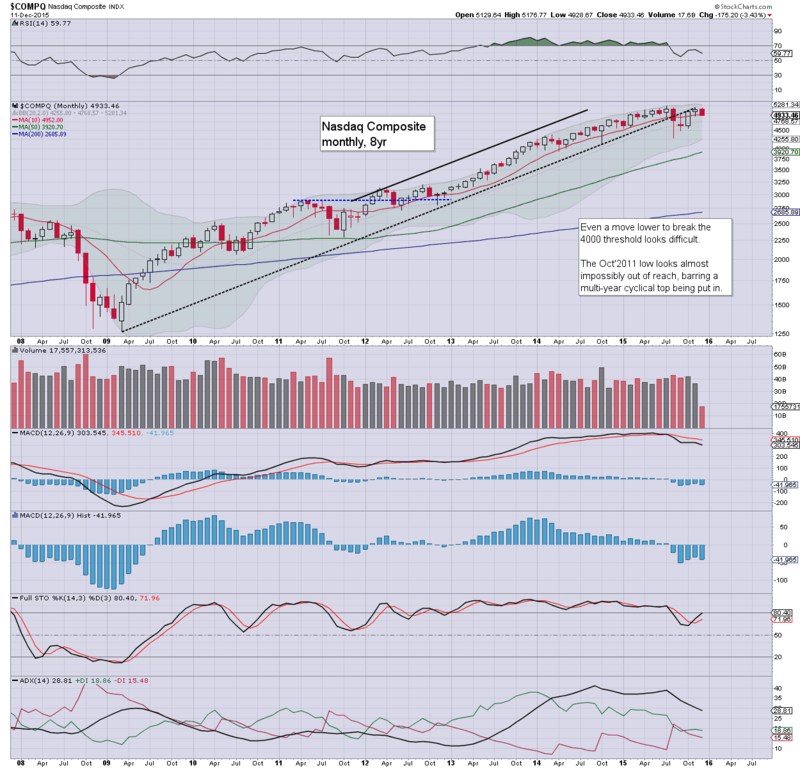 The second market leader - R2K, is currently -6.2%, and like the NYSE comp', is so far unable to break/hold above the 10MA of 1195. 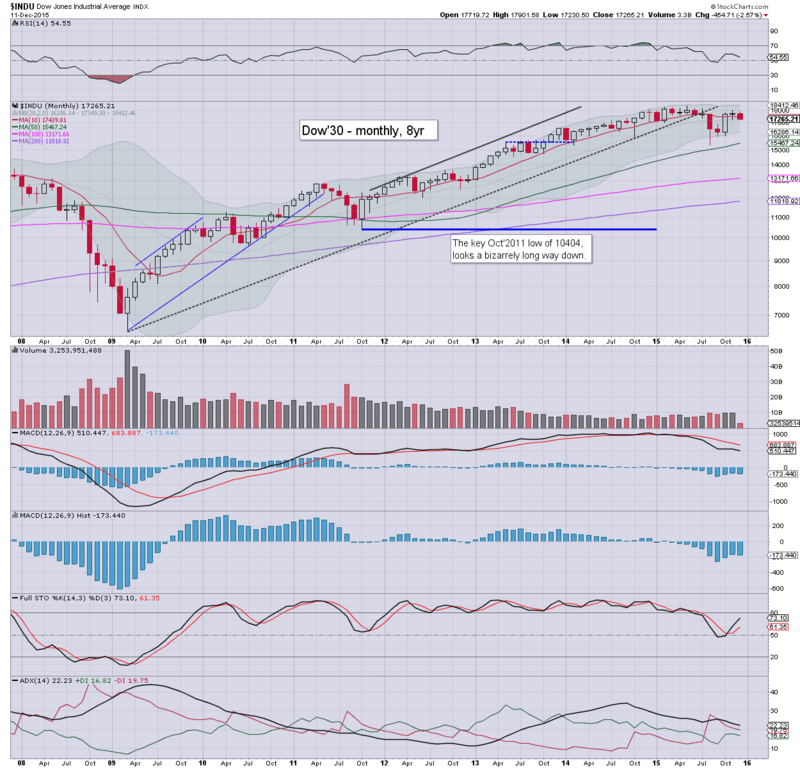 First downside target would be the Sept' low of 1078... 1050, and then the giant 1K threshold. 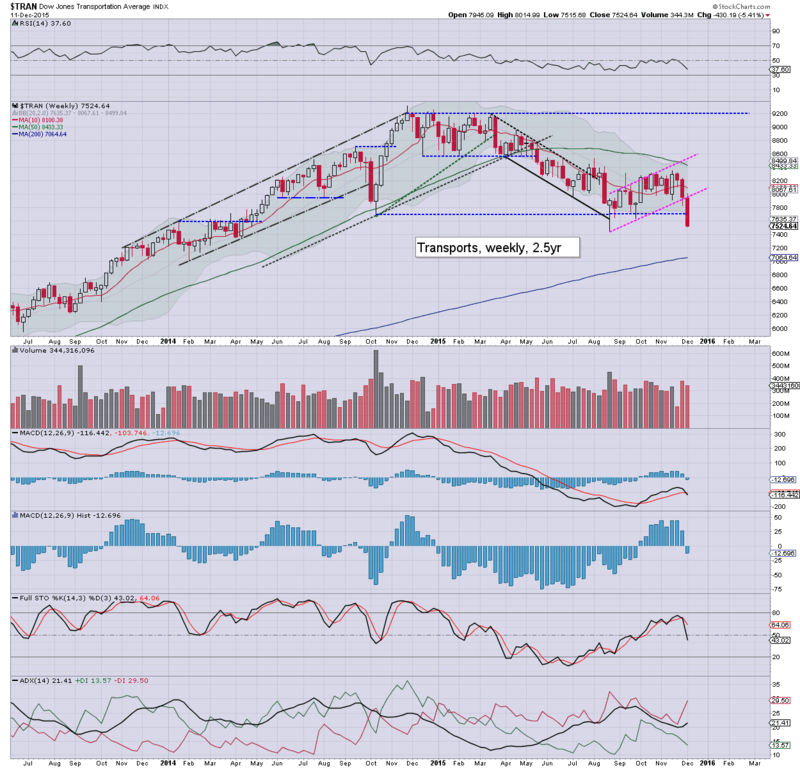 The 'old leader' - Trans, is leading the way lower, currently -7.1% in the 7500s. Underlying MACD cycle remains deeply negative. If the Aug' low of 7452 fails to hold, it will open the door to next support in the 6000/5500 zone. So far it is a pretty bearish month, but then, often is the case that December will see weakness in the first half, only to then hyper-ramp into year end/early 2016. Price structure is offering bear flags for most indexes... with many still unable to trade back above their respective 10MA. With price structure offering giant bear flags - as is also the case on many world equity markets, I am starting to believe that the post FOMC rally is going to FAIL to break new highs in the headline (Dow, sp'500, Nasdaq) indexes. Certainly... the Transports would take at least 4-5 months to break new highs, and that's assuming a straight up move with no problems at all. 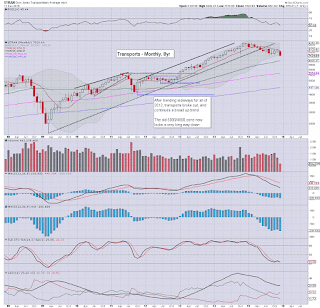 To be absolutely clear.... if the next multi-week up cycle after the FOMC does not result in new historic highs in the Dow, sp'500, and Nasdaq, then this market is in serious trouble. 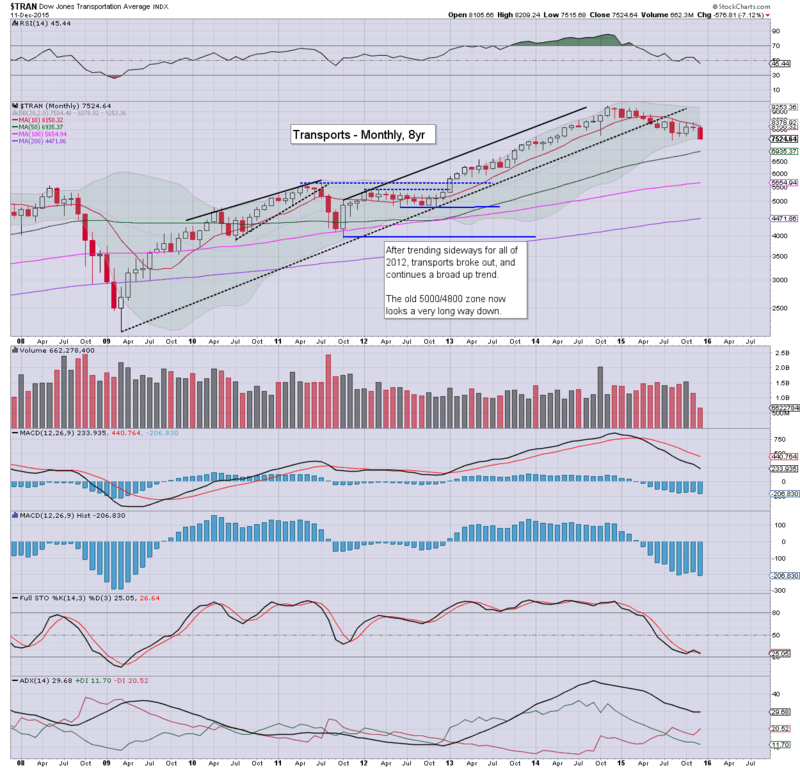 Seasonally, the market tends to max out in mid/late January, so... whatever level we're trading at then... I'd not be long... and would probably pick up an index-short. The FOMC announcement is due at 2pm. Market is expecting the first interest rate increase since 2006, of 25bps, aka 0.25%, to a rate of 0.25%. There will be a Yellen press conf' around 2.30pm, and that will very likely last a full hour. Indeed, Friday will be pretty dynamic with the last big opex of the year, expect some significant price chop into the weekly close. It will be interesting to see if the market makers will be able to pin the sp'500 around 2050.. which would be the natural level to settle at. 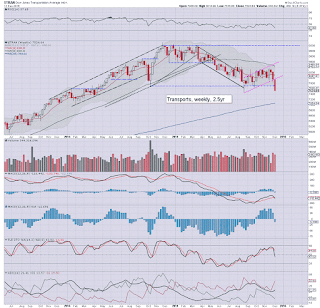 It was a very bearish end to the week, with a net weekly decline for the sp'500 of -79pts (3.8%) at 2012. 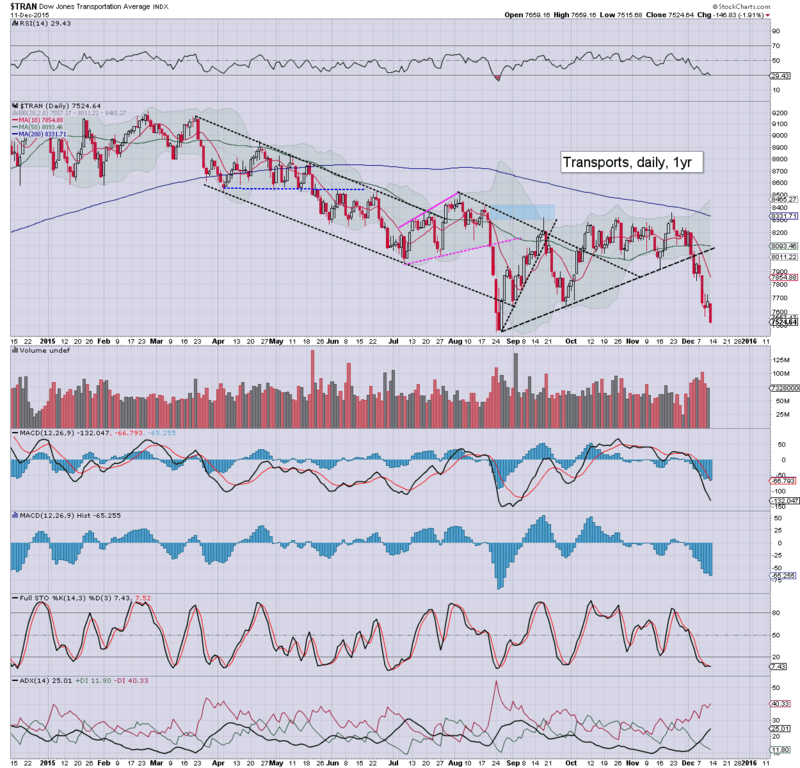 The 'old leader' - Transports, imploded by -5.4% to 7524. 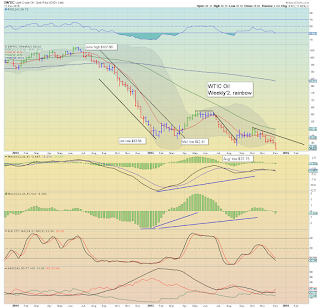 Meanwhile, WTIC Oil saw a net weekly decline of -$4.52 (11.3%) @ $35.62, the lowest level since Feb'2009. 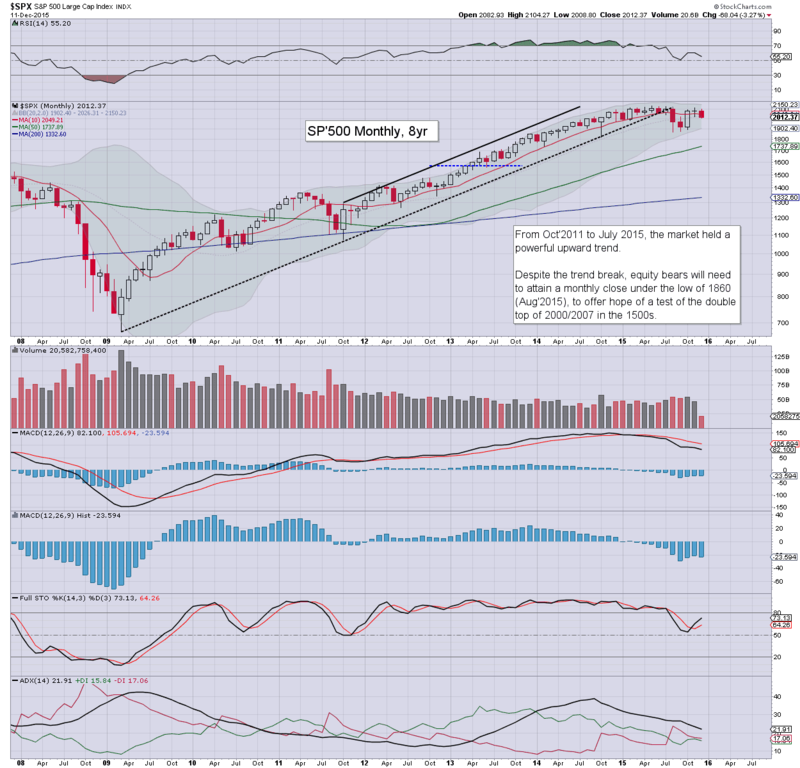 sp'500 - price structure could be a giant bull flag... if so... new historic highs.. no later than mid January. 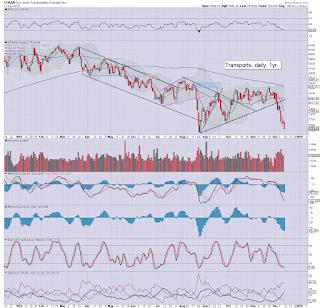 Transports - giant bear flag, confirmed, a fierce net weekly decline, now within range of the Aug' low of 7452. 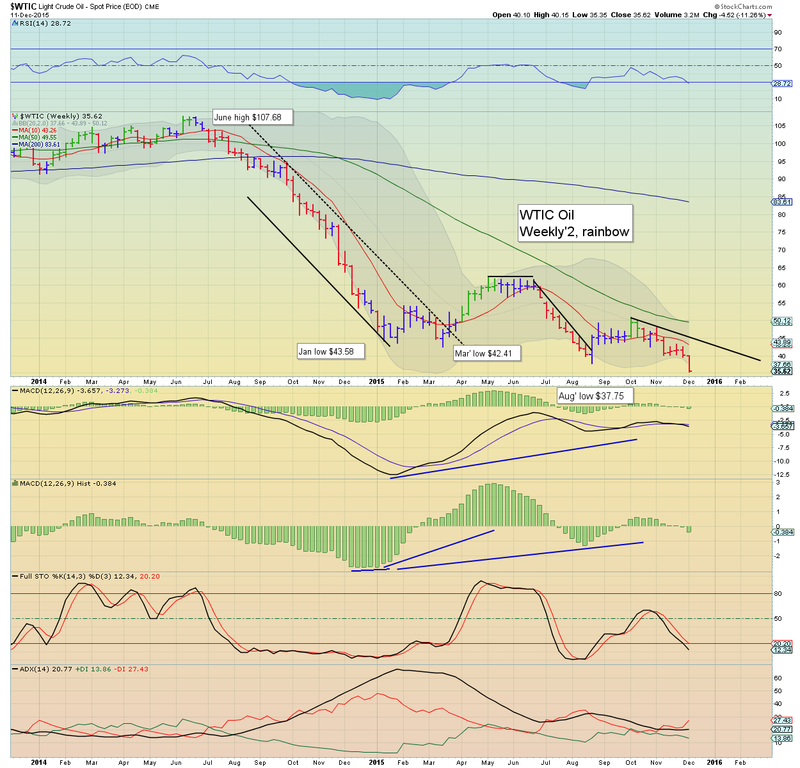 WTIC Oil - the sixth consecutive red 'rainbow' candle... ZERO sign of a floor, as the supply issue remains completely unresolved. 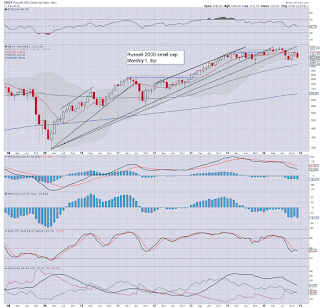 US equities closed very significantly lower, sp -39pts @ 2012 (intra low 2008). The two leaders - Trans/R2K, settled lower by -1.9% and -2.2% respectively. 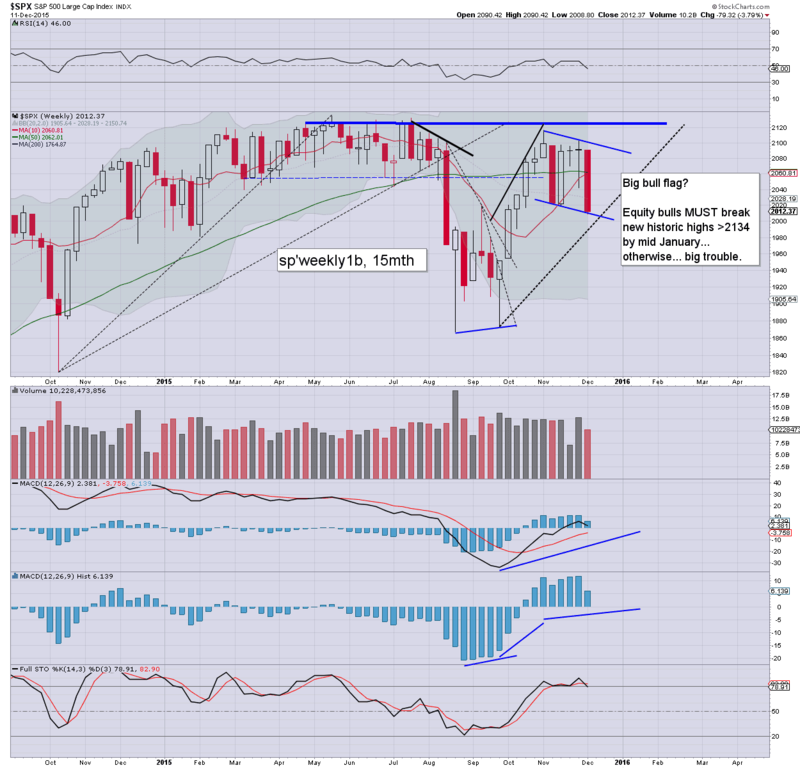 Equities look set to rebound after the FOMC is out of the way. Suffice to note, strong net daily declines, with the sp' decisively breaking the Nov' 16th low of 2019. 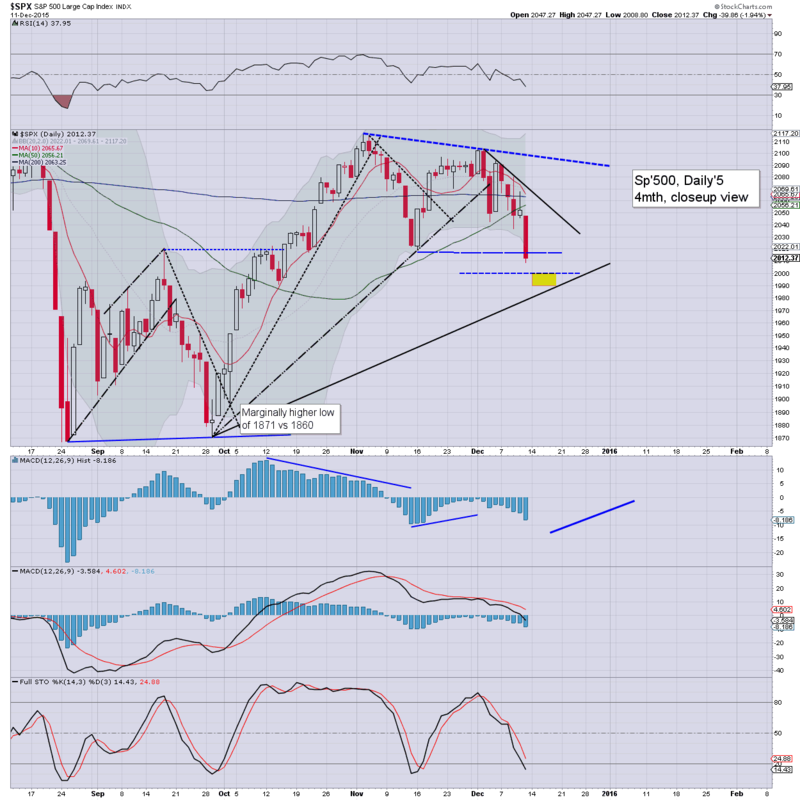 Next support is the psy' level of sp'2K, with price cluster of the 1990s. 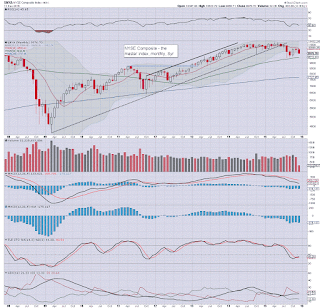 Sustained action under 2K does not look likely into year end. 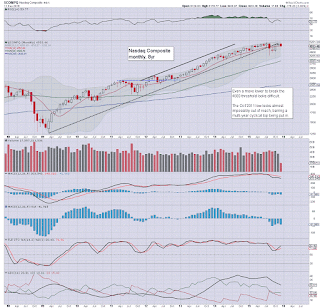 Instead, a post FOMC rally looks due... with the 2100s still viable before year end.